In honor of once again reaching the Make Room for Kids goal, and surpassing it by a whopping $600 this year, it’s time for me to reveal an embarrassing picture from my sordid past as a Supremely Awkward Being. I’m still a Supremely Awkward Being, but I’ve learned to internalize it under a candy-coated shell of hair, makeup, drugstore product, and Target clothes. I … I’m sorry. I’ll give you a moment to compose yourself. I don’t know where to start. Is this Photoshop? Did I really look like this? Dress like this? Believe this to be an acceptable appearance even if it was the 90s? Yes, 1995. I can’t even use the excuse that I was a teenager. I was 21 in this picture. Drinking age. Maybe I was drunk? I wasn’t drunk. I’ve only been drunk two times in my life, and this wasn’t one of them. Look at my twin sisters. They look so normal. Then look at me. Now look at them. Now back to me. We look about as blood related as you and your dog. Am I grunge? Am I a Crip? A Hogwart? A Shark? Am I packing a Nirvana cassette, a sawed off shotgun, a broomstick, or a vicious set of musical finger snaps in my belt? We’ll never know. But we know this for sure … there’s pretty much nothing I won’t do for sick kids. Thank you for donating, retweeting, sharing, and everything else you all did to make the $10,000 happen. I can’t wait to show you in April what your donations made possible for Pittsburgh’s sick kids. JK, I’ve seen / been much worse. My mullet was not exactly a thing of beauty. Now I know what she would look like if Slash and Axl Rose had a daughter. Congratulations on exceeding the goal! Are you reeeeally sure you’re not from Portland? Love , Love , Love the hair . Really . 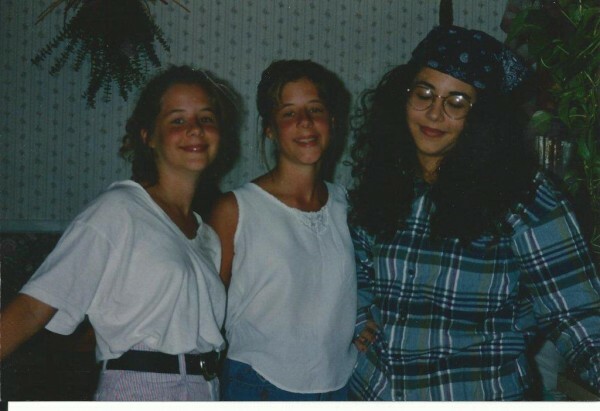 The sad part is, my 21-year-old self would have been all over that, trying to get into your … um, bandanna. Maybe it was your turn to wash the car and the dog that day?